Vargis is an engineer at Nettech Electronics Recycling in Mott Haven, The Bronx. Nestled under the off-ramp of the 3rd Avenue Bridge, Nettech is the operating theatre where Vargis performs open-heart surgery on spent PCs, restoring them to full health, installing the latest operating systems, posting them on E-bay, and shipping them back out into circulation. Electronic waste, or e-waste, is the fastest growing waste stream in the world, according to the United Nations Environment Program. The United States was the biggest global culprit in 2014, producing 7.1 million tons of the stuff, or 17 percent of the world’s share, according to a United Nations report published last month, which identifies ever-shortening product lifespans as contributing to the rise. Here in New York City, although e-waste makes up for only one percent of the municipal waste stream by weight, it’s the fastest growing subset classified as hazardous waste, according to Keith Mellis, spokesman for the sanitation department. Trapped inside gadgetry are heavy metals like mercury and lead and dangerous chemicals, constituting a “toxic mine” that unless managed with extreme care pose a significant environmental risk, David Malone, the UN Under-Secretary-General, said in a press release. In New York, dumping electronics in the trash became illegal Jan 1st this year and since April, the rule has been enforced with a $100 fine for leaving electronic goods at the curbside for general collection. Instead, the law requires that e-waste be brought to a designated recycling location, by off-loading at chain stores that offer recycle programs, such as Staples or Best Buy, or at a disposal event. Also, consumers who live in an apartment block with ten or more living units can sign up to a free collection service, e-cycleNYC. The sanitation department has seen a large uptick in e-waste recycling since the disposal ban took effect and the agency’s apartment building collection program has more than tripled, a spokesman said. But after bidding farewell to that once-loved gizmo, where does it end up? 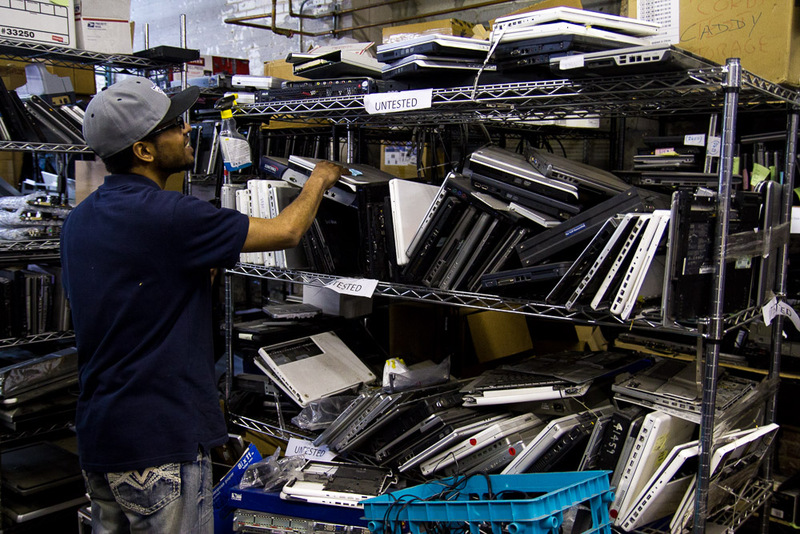 E-waste collected by New York’s sanitation department is processed by a waste management company, Electronics Recyclers International, which consolidates the city’s unwanted devices in New Jersey before sending it to Massachusetts. There, state-of-the-art machinery shreds 15,000 pounds of electronics every hour. The company is accredited as meeting the Environmental Protection Agency’s “R2” responsible recycling standards. Nut some less scrupulous organisations often ship e-waste overseas, literally dumping the problem elsewhere. According to the most recent data available, ten percent of North America’s e-waste was exported in 2010 to destinations such as Mexico, Venezuela, Paraguay, and China, where valuable materials are often cherry-picked, leaving the remaining hazardous waste to wind up in landfill. Nettech acquires its unwanted machines directly from businesses, hospitals, and state agencies that are retiring outdated systems. The 2,500 square foot workshop is one of eight e-waste recycling facilities registered with the environmental conservation department in New York City, and it processes 2,000 pounds of e-waste a week. If a machine is unrecoverable, or is so outdated there is no economic incentive to refurbish, Percy will strip it for parts. Along with the toxic materials lurking in electronic devices, old computers also contain an “urban mine,” a large potential reservoir of recyclable materials and precious metals, according to the United Nations University. Steel casing goes to a smelting plant, where the gold and copper found on circuit boards are recovered by eliminating the plastic at high temperatures.